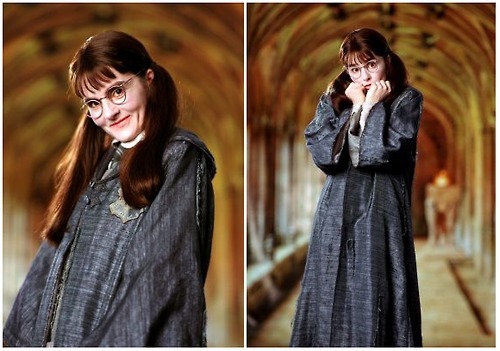 I have seriously felt like Moaning Myrtle the last few days. It’s been horrible! Study? Moan. Practise? Moan. Textbook? Throw. Exam? Double moan! However, I did finish an exam half hour ago and I think I did pretty well, meaning the hard part is over… for now. Anyway, this was a quick little idea inspired by the Wizarding World Theme Park (you know what I’m about to say, don’t you?). Moaning Myrtle has been heard from the bathrooms there, and why should my bathroom be any different? I’ve conjured up an audio file from the COS and GOF movies which features 4 minutes of her moaning voice. I figure, if you have an old cd player, mp3 player, ipod, phone – some sort of musical device – you can copy the file onto, you’re all set! If you’re using an old phone, make sure no one can ring you on it. Leave the file on repeat and hide it somewhere in your toilet or bathroom (perhaps on a window sill). I’m still trying to work out exactly how to hide my device, as I don’t want guests to become curious and start looking for the source of the audio. I might hide it in a box or something they won’t be game to mess around with. You don’t want the sound too loud as you don’t want it to carry out of the room, hence the volume on a small music device rather than speakers is perfect. Of course, the problem is the batteries will only last so long, and so if you expect your party to continue for a lengthy few hours, you may want to delay turning the device on or have a few spare devices/batteries. ~ by acciomagic on September 12, 2011. Hi! I tried to download the Moaning Myrtle mp3 but it says file not found… Could you help me out? I’d love to use it for my little brother’s birthday this Saturday. Thanks and great website! Oh, I’m sorry! Thank you for pointing this out to me 🙂 Looks like I’ll have to find another uploader if they delete the files. I have updated the download link for now so it should be working again. Good luck with the party! Thank you sooooo much! You don’t know how long I have been looking for this, NO ONE else has it! (And tons of people are looking!) It is excellent quality, this is sure to be a hit! (at least in the loo! 🙂 )Thank you once again, my little brother will be sooo happy! I have been searching for moaning Myrtle signs all day! Thank you so much! It’ll go great for my husband’s birthday party!